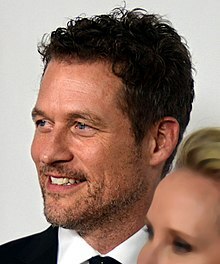 James Tupper (born August 4, 1965) is a Canadian actor known for his roles as Jack Slattery on the ABC television series Men in Trees, Dr. Chris Sands on the NBC medical drama series Mercy, and David Clarke on ABC's Revenge. He also starred in the post-apocalyptic thriller Aftermath, on Space in Canada and Syfy in the U.S.
Tupper was born in Dartmouth, Nova Scotia, Canada. During his childhood and early adulthood he attended at 10 day church camp every summer called berwick camp. Located at Berwick campgrounds in Berwick, Nova Scotia, Canada. After high school, he lived on a coffee farm in Kenya and studied Swahili. He studied acting at Concordia University, Montreal, and later at Rutgers University in New Jersey, where he earned a master's degree. Tupper acted in several off-Broadway plays, including An Actor Prepares and After the Rain. He co-wrote and appeared in 2005's Loudmouth Soup, a fully improvised independent film that was filmed in one night with no script and no second takes. From 2006, Tupper portrayed Jack Slattery in the ABC series Men in Trees, credited for all 36 episodes of the show's run. He then appeared as Dr. Chris Sands in the NBC medical drama Mercy for 22 episodes before it was cancelled in 2010. Tupper appeared as Dr. Andrew Perkins, a trauma counselor, on ABC's Grey's Anatomy. He appeared in seven episodes in the show's seventh season. Tupper appeared on ABC's Revenge from 2011 to its cancellation in 2015. He portrayed the character of David Clarke, the supposedly deceased father of the main character. Clarke was a recurring character for the first three seasons, appearing only in flashbacks and videos. Tupper was promoted to main cast for season four after it was revealed in the season three finale that his character was still alive. On September 27, 2016, the British Columbia, Canada-produced post-apocalyptic action thriller Aftermath debuted on Canada's Space network and on America's Syfy network. The science-fiction drama stars Tupper as university professor Josh Copeland who, with his family, endure what appears to be the beginning of The Bible's final Book of Revelation and its end times, with terrifying storms, volcano eruptions, and the reappearance of previously-thought-extinct raptor birds. But the worst danger comes from so-called "fever-heads," humans who contract a disease that make them deliriously dangerous and ultimately murderous. Tupper's TV family includes real-life partner Anne Heche as his tough-but-tender wife Karen, a U.S. Air Force pilot, and their three nearly-grown children. In addition to his acting role on the series, Tupper served as co-producer. The freshman season's 13-episode run ended December 20, 2016; the series was not renewed. Tupper split from his wife in November 2006 and moved in with actress Anne Heche in August 2007, after they met on the set of Men in Trees. Their son, Atlas Heche Tupper, was born on March 7, 2009. 2005 How I Met Your Mother Derek 1 episode: "The Limo"
^ Linekin, Kim (February 19, 2010). "Hottest Canadians on U.S. TV". Canada msn Entertainment. Retrieved July 23, 2014. ^ Thomas, Rachel (October 2007). "An Interview with James Tupper (Jack, Men in Trees)". About.com. Retrieved July 23, 2014. ^ Stevens, Dana (September 22, 2005). "Let's Do Dinner (Ulterior Motive for Dessert)". The New York Times. Retrieved July 23, 2014. ^ Abrams, Natalie (July 15, 2010). "James Tupper to Guest-Star on Grey's Anatomy". TVGuide.com. Retrieved July 23, 2014. ^ Bentley, Jean (June 9, 2014). "Revenge season 4 adds James Tupper as regular". zap2it. Retrieved July 23, 2014. ^ Pringle, Gill (May 1, 2011). "Anne Heche interview: "There was no joy in my family"". The Telegraph. Retrieved July 23, 2014. ^ Chiu, Alexis (March 11, 2009). "It's a Baby Boy for Anne Heche!". People. Retrieved July 16, 2009. This page was last edited on 9 November 2018, at 02:37 (UTC).